The interviewee Erin Adams, is running for House of Representatives - District 33 in Oklahoma as Libertarian. 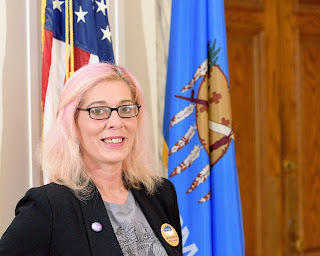 You can find more information on Erin on Facebook facebook.com/erinadamsforcongress/ and follow on Twitter at @ErinAdams4OK. Interviewer is Lead Contributor for the Liberty Chronicle Independent; Seattle-based independent journalist, David Malekar. DM: Thank you Erin for giving readers a chance to see what your campaign and platform is all about. Let's start with what position you are running for and location? 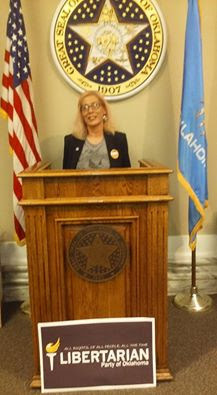 EA: I am running for State House district 33 In Oklahoma. House Bill 2275 allows The state to collect your DNA at the time of arrest for many charges without a warrant or a probable cause hearing. While I understand the intent of the bill to be well meaning, the language MUST be amended to read "only after a probable cause hearing has found it to be justified." The war on drugs costs American tax payers $500.00 per second. If elected I will introduce legislation to end the high price paid by the citizens of Oklahoma in both taxes and personal freedom. DM: What has brought you to the 2016 campaign trail? DM: It appears already that you are a supporter of Criminal Justice Reform and look to make some changes in the right direction towards personal safety and freedom. What else can be done to help mend the relations between Public Servants and Citizens in that regard, and accountability? EA: I think we need to end self investigation. We cannot trust any agency to investigate itself. In the private sector, the government will not allow a manufacturer or a business to audit itself, so why do we allow the government to do so? We need independent investigators in cases of possible police misconduct or government malfeasance for starters. We also need to improve our dialogue. DM: Secrecy by those who are supposed to represent the people is and has been an ongoing issue for too long. What other measures of transparency can we know will happen with an Erin Adams in office? EA: We welcome public review of our campaign finances. If elected, I plan on holding Quarterly town halls in my district to allow constituents an opportunity to review any up coming issues and how I plan to vote on each of them. DM: What are your plans for local Education? What can be done to improve the resources and options? DM: What types of options of schooling would you like to see take the D.O.E. place? EA: We didn't have a DOE until Former President Carter Gifted us with one. I see no reason that we cant still have public schools without a DOE however I believe we would see private schools popping up everywhere to offer true free market competition to our current public schools. The winners in this would be our children. DM: Many may be hesitant to see the D.O.E. be broken down overnight. Would we see a transition to ease the minds of those concerned? Such as green lighting after a certain about of alternatives declare they are prepared for the capacity? EA: Yes. Here in Oklahoma I would like to us start with consolidating the "upper" end. Currently in Oklahoma, we have a superintendent for EVERY district and we have a district for almost every town. Pink Oklahoma will graduate 9 students next spring but we pay a superintendent and staff for that district. We are top heavy and the victims in that are our students and our teachers. I would like to see a voucher program where the money truly followed the student. DM: The spending problem seems to be an issue with overhead, in Education nationally. Is there any other wasteful spending that you would like to see changed within your District? I know we touched on this a little in the beginning of our Q&A. EA: There are many areas where we see this at the state level. Oklahoma currently faces a huge deficit. In 2016 if we look at spending, we see 9.9 billion on Education, 2.1 Billion on Protection, 2.9 Billion on transportation, 1.6 billion on welfare, 2.7 billion in pensions, and right around 8 billion in health care. I think ALL of these programs would benefit from reduction in overhead. Additionally we spend tax payer money litigating things we simply cant win. The Law suit with Colorado is a black hole of waste financially. The multiple suits concerning the ten commandments statue at the capitol continue to drain the coffers and the tax payers continue to be legislated into deeper poverty. DM: People are really going to take notice of your campaign based off your stances and willingness to make changes for the better. How can readers/citizens get involved to help you with your campaign? What social media links can you provide for those who want to follow you, or links to volunteer/donate? DM: The media generally has an agenda when interviewing candidates. I wanted to give you the floor and discuss any other item(s) that you may not have the chance to speak on, with other outlets. At this time, feel free to take it away. EA: House Bill 2275 allows The state to collect your DNA at the time of arrest for many charges without a warrant or a probable cause hearing. While I understand the intent of the bill to be well meaning, the language MUST be amended to read "only after a probable cause hearing has found it to be justified.". Anytime we allow Government to erode civil liberties in the name of "safety" we open the door to elimination of our own Liberties. I want to address what some see as the Elephant in the room. 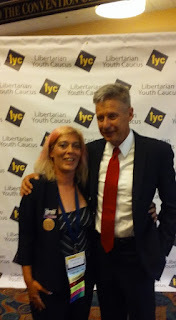 I can't tell you how many times I hear something like , “ A vote for a third party is a wasted vote” or , “ if you vote third party you are giving the election to (whomever you don't like the most)”. I want to remind the “lesser of two evils” crowd, that the lesser of two evils is still evil. Lets talk about what a vote is. A vote is our way of communicating a preference in candidates. It is a way to communicate and as a candidate, what your vote says , if you cast it for me, is that, mostly, you support the stances I am taking. That you and I agree. When you cast a vote for a candidate you do not agree with, one you do not support, you are essentially miss-communicating. You are telling the candidate you voted for that you agree with and support them. Do you? A “Third Party” candidate might not win the election, true enough, but casting your vote for a candidate NOT from the big two DOES send a clear message that business as usual isn't working for you any more. It tells everyone else running that you DID Not support their beliefs. If politics as usual is working for you, awesome, vote the same way you always have. If it isn't, remember, if you do what you have always done, you will get what you have always gotten. DM: We look forward to following up with you again as November draws closer. What final thoughts would you like to leave with readers and voters? EA: We all want a “Revolution,” a cause to get behind, a “community” that we feel a part of. Call it human nature or whatever other “title” you want, it’s important for us to feel at one with…..well…something. Most generations find a “cause” and those who have a tougher time doing so seem to create one. And it’s really true, we DO all want to change the world. The “trouble” comes when we can’t agree on how to do it. Most of us want the same things, but we spend so much time infighting about the methods that nothing really changes. I want a revolution, I do, I want to see a world where we all agree that my rights stop where yours start, and vice versa. Where we can understand that it isn’t okay to hurt people or take their stuff. I want to live in a world where we all agree that the initiation of force to achieve social or political goals is not okay and we can agree not only to apply that ourselves, but to apply it to group actions, including government actions, as well. If you want the same revolution I do, Please, look into the Libertarian party. This contribution is from Seattle-based independent journalist, David Malekar, Lead Contributor for the Liberty Chronicle Independent; who publishes content to the WashCo Chronicle and other online publications. 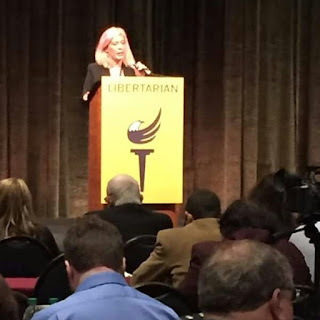 The interviewee Erin Adams, is running for House of Representative - District 33 in Oklahoma as Libertarian. You can find more information on Erin on Facebook facebook.com/erinadamsforcongress/ and follow on Twitter at @ErinAdams4OK.